Upon walking into the Waretown, New Jersey restaurant, Breakers Kitchen and Tap, employees are hard at work preparing for the day. The bartender is squeezing fresh lime juice to top off their specialty drinks, as the wait staff is tidying up each table with silverware and menus. Customers begin to arrive shortly after the doors open at 11:30 am for the lunchtime rush, as owners Kelly Ford and Katie Davis immediately greet each guest. This is what to expect when visiting this new eatery, celebrating their “Grand Opening” early last month. The location was home to the former restaurant and bar Longshots, which occupied the space until 2012. The building had remained idle until sister’s Ford and Davis made an offer in January 2017. “The property was vacant for a while and the price kept going down until finally it hit our mark,” said Ford. “We took it as a sign to purchase and move forward with our dream of running a restaurant.” The location holds a special place in the girls’ hearts as it also commemorates the final time they shared a beer with their father, who unexpectedly passed away one week after the three dined at Longshots together. Pictures of the family are currently displayed on the wall at the exact spot where the photos were taken that day. With the help of their chef, Matt Kenney, the team was ready to introduce Breakers Kitchen & Tap to the community, just in time for the scheduled February 9th Grand Opening. “We spent a couple of days fine tuning after a rough soft opening on February 6th,” said Ford. “It was supposed to be invitation only, but people started flooding in. We’ve been packed ever since!” The sisters are no strangers to the hustle and bustle of the restaurant industry as they both began their careers as managers of Macaroni Grill in Dallas, Texas. “We eventually went our separate ways – myself pursuing a career in Education and Katie in Social Work – we never forgot that training,” said Ford. Hailing from Denver, Colorado, Kenney worked at various restaurants before landing the Head Chef position at Breaker’s Kitchen & Tap. “We were excited when Matt came on board because he can incorporate some Denver flavors into our dishes,” said Ford. “He added a lot of recipes to the menu.” Some of Kenney’s favorite creations are the 14 ounce Grilled Prime Bone-In Pork Chop topped off with a salt-pepper crust and dried cherry glaze and the Signature Crab Cakes with sautéed diced onions, celery, bell pepper and special seasoning. It is always all hands on deck for the duo who spend much of their time at the restaurant getting to know each customer. “One of us is here at all times to touch the tables and introduce ourselves,” said Ford. Their hard work has not gone unnoticed as the Breakers Kitchen & Tap Facebook page has nearly 2,000 followers and 250 reviews. “If you look at our reviews on Facebook, most are praising our customer service, which is a big focus of ours,” said Ford. The girls credit the positive feedback to a system they implemented using teal and white napkins to help the employees identify the new visitors. “We distribute white napkins to our first time visitors, and teal napkins to our regulars,” said Ford. “We want to see more white napkins, that’s the goal because that means we have more new customers.” The restaurant will also be bringing in a lot of familiar faces as guests are getting more comfortable at the casual eatery. “It’s great to hear people say ‘we love the vibe. We needed a place like this!’” said Ford. Breakers Kitchen & Tap is open Monday through Sunday from 11:30 am to 12:00 am. Guests are invited to enjoy live entertainment every weekend starting at 7:00 pm and Trivia every Tuesday at 7:00 pm. Takeout is also available. 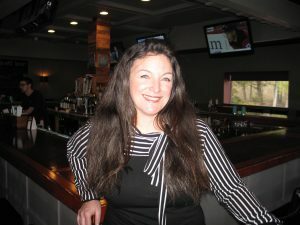 For more information, visit their website at https://www.breakerskitchenandtap.com/ or call 609.622.2963.